The company jet flew for nearly 13,000 hours and boasted more than 10,000 landings at the time of its retirement in 2009. Though Duncan Aviation team members sold the aircraft’s engines and all salvageable parts, they kept the shell of the aircraft intact for years before it made its shift to sculpture along the main entrance drive of Duncan Aviation’s Lincoln, Nebraska, facility. During the past five months, team members wrote messages inside the retired company jet, creating a unique time capsule that captured the experiences of anyone who piloted, flew in, worked on, purchased and delivered parts for, cleaned, fueled and towed this piece of Duncan Aviation history. 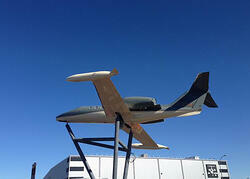 Though the Learjet was added to the campus late this year, plans for the monument began nearly four years ago. With a lot research, planning and modification of the aircraft, a piece of Duncan Aviation’s early days now sits across from the newly opened 175,000-square-foot maintenance hangars. To view the time capsule’s interior, newly painted exterior and progression from hangar storage to three-prong stand, view the following time lapse video.